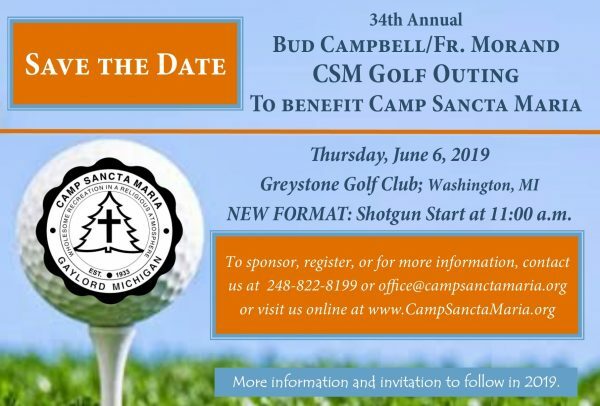 Thank You for Supporting CSM’s Mission! On behalf of our campers and their families, please accept our heartfelt gratitude for your support of Camp Sancta Maria. We are honored to have a role in the process of forming young Christian lives–the lives of our precious children and grandchildren–and we are truly grateful you have chosen to partner with us in this most important mission. Your contribution means an immense amount to us because the cost to run Camp is higher than the tuition we set. 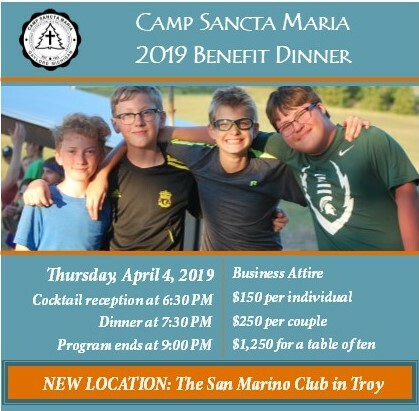 Camp Sancta Maria (EIN 38-6086752) is a tax exempt 501(c)(3) nonprofit organization held in a trust governed by an independent Board of Trustees. While we serve families from all seven dioceses of Michigan (and beyond), no diocese is responsible for CSM financially. This means we are responsible to secure our own funding to advance the mission that has been passed down to us since our founding in 1933. To continue this essential work, we need your help. Please prayerfully consider helping Camp Sancta Maria with your time, your talent, and your treasure. Join the CSM family and be part of forming young Christian lives! Thank you, and God bless you. Please join us for our 2019 Benefit Dinner. Not only will you be helping Camp, but we promise you a fun evening surrounded by great people, lots of laughs, and a delicious meal, as well! Consider inviting someone new to join you this year. We look forward to seeing you there! Your donations support CSM families, facilities, and programs. Because of your gifts, kids are able to come to Camp and learn new skills, make new friends, work as a team, encourage and support one another, and grow in their relationship with the Lord. Faith and fun all in one place! In addition, we strive to provide every child access to the CSM experience regardless of their ability to pay. CSM’s Scholarship Fund allows us to ensure, with your help, that no child is turned away. Thank you!  If you would like assistance using our secure online donation tool below, or if you would like to bypass the online tool and simply donate via credit card over the phone, please call us at 248-822-8199 or email us at office@campsanctamaria.org and we would be happy to assist you. Holiday (and everyday!) shopping is easy with Amazon. Amazon donates to Camp Sancta Maria! Thank you to everyone who supported us through Smile.Amazon.com this past year. We’re pleased to announce that as of December 31, 2018, we have received over $650 in donations from Amazon THANKS TO YOUR SUPPORT! We are grateful for your support. Are you a Smile.Amazon.com veteran? Thank you, and keep up the good work! Is Smile.Amazon.com new to you? Please consider Smile.Amazon.com when you shop for your Christmas gifts this year. Here’s how it works…. Smile.Amazon.com is the same Amazon you know. Same products, same prices, same service. It’s just a different door to the website and Amazon will donate 0.5% of the price of your eligible AmazonSmile purchases to Camp Sancta Maria at no extra cost to you! Support us when you shop this Christmas season. Go to smile.amazon.com/ch/38-6086752 and Amazon donates to Camp Sancta Maria. Thank you! We appreciate your support all year long! If all our Camp families and friends shop with Smile.Amazon.com, this will be a substantial recurring benefit to our kids. Think of it as all of us sharing the same cashback card. Whenever you shop online, go to Smile.Amazon.com and you will be supporting our children and grandchildren with money you are already spending. Thank you! Camp Sancta Maria (EIN 38-6086752) is a tax exempt nonprofit charity held in a trust governed by an independent Board of Trustees. While we serve families from all seven dioceses of Michigan (and beyond), no diocese is responsible for CSM financially. This means we are responsible to secure our own funding to advance the mission that has been passed down to us since our founding in 1933. To continue this essential work, we need your help. Please prayerfully consider helping Camp Sancta Maria with your time, your talent, and your treasure. Join the CSM family and be part of forming young Christian lives! Thank you, and God bless you.